Getting free lumber might seem like an impossible feat, but with a plan and a few unique ideas, it is possible to get some good quality free lumber for any of your projects. Before you go out and buy a truckload of lumber, consider some of these tips below for how to get free lumber. You can use one of these methods to find lumber that's free but still looks good enough for any project. Using free lumber will not only save you money, but it's also a great way to reuse a resource that might otherwise get thrown away. Looking for more free materials? 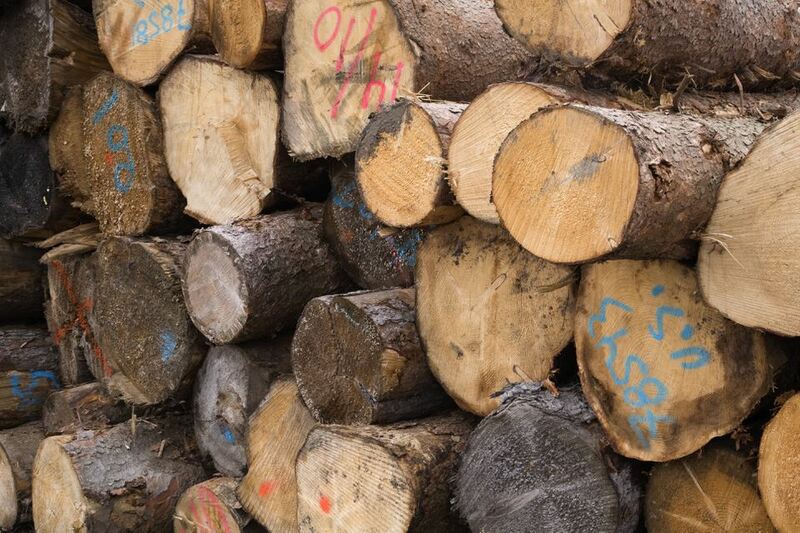 Learn how to find free firewood to burn in your home this winter. You can also find out how to find free pallets you can use with these free pallet DIY projects and many other woodworking projects. In most locations, there are construction sites somewhere nearby, which may be one of the biggest sources of free lumber. Sites that are tearing down old homes and buildings are going to have the wood removed from the site to make room for their new projects, and there are two ways you can take advantage of his. The first is a one-off. Find to an employee at the site and ask if you can talk to his manager or supervisor. Once you've met with someone of authority over the area, ask if you can take some of the lumber off their hands for them. They'll probably be willing to comply because they surely have a budget in place for a removal service, and you'll be doing it for free. The other option is similar but is meant for long term. Make a deal where you'll come back on a regular basis to haul off as much scrap and debris as you can if you can exchange that labor for free lumber. This may work by having you leave a trailer at the site where they can dump what they can onto it. You can go through the pile at home every day or week and discard what you don't want. If you go with this second scenario, you may even leave two trailers and insist that they put usable lumber on one and everything else on another, which would make it much easier for you to manage. This means a little extra work for them, but it's worth a shot to ask. Given that construction projects normally dispose of a lot more than what can fit on your two trailers, you probably won't be taking away all of their waste but removing even a fraction of it can save them money in the long run. Something may still be useful if the majority of it isn't salvageable. Watch out for these types of things as you're working at home and with other people. For example, when throwing out an old bed, just get rid of the mattress — there's no need to toss the whole thing. Even if you can't make use of all of the wooden frame, you may be able to tear down some of the pieces and use them for something else. The same goes with an old barn, shed, or something similar. Take the extra time to carefully remove any lumber that still looks good. What better place is there to look for someone's "garbage" than a dumpster or burn pit? If somebody is throwing out their own furniture or even lumber they don't want, you'll find it here. You may consider visiting a dump. It's normally legal to go through trash that's been deposited in a public dump area, in which case you can dive in and take apart what you want to extract the free lumber. Just remember to wear heavy duty gloves and eye protection. You could also drive around on the day of or day before trash pickup to see if your neighbors or anyone else in your town has usable lumber sticking out of their trash bins or lying next to them. If you find some, be sure to ask the owner if you can take it. It may seem unnecessary since it's trash, but it's still on their property and probably legally belongs to them until the dump service removes it. Most of the above can be summarized here. Short of stealing it (which we don't recommend! ), networking with others is the only way you're going to get free lumber from someone else. But if you've had no luck finding someone in your vicinity, or you simply want a greater reach for even more free lumber, try going to the newspapers and the internet. The idea is simple: let people know what you want. Craigslist is a good place put up a want ad or advertise a clean trade for some free lumber. The Freecycle Network and Gumtree Ads are a couple others that are a good place to look for lumber and request free lumber. And don't forget about social networking sites like Facebook and Twitter. It's especially helpful to join local Facebook groups near you that specializes in free stuff or swaps. Before doing this, you should first decide what it is that you're willing to do for the lumber. If you want to trade something else that you already want to get rid of, someone may trade their excess lumber for what you have. Or maybe somebody has such an overflow of lumber already that they're willing to get rid of some of it for free, and possibly even deliver it to you at no cost.